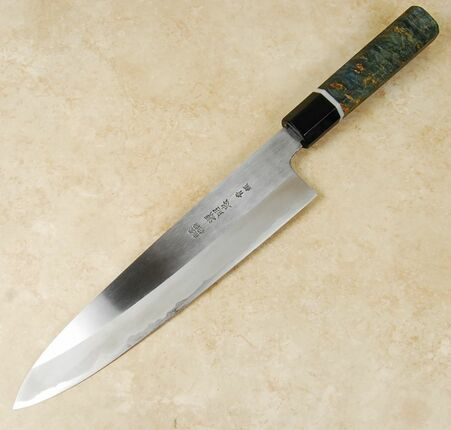 We are drawn to knife makers who employ the traditional techniques of blacksmithing. Mizuno-san is a 60-year-old master smith who adheres to these age-old methods over the newer, and quicker, solutions so often used by many current knife makers. He uses a traditional charcoal fire and straw ash in his forge. It is thought that making blades in this manner increases the carbon content of the alloy and results in better blades with harder edges. He also does his own cladding unlike many who now use pre-made stock from iron foundries. 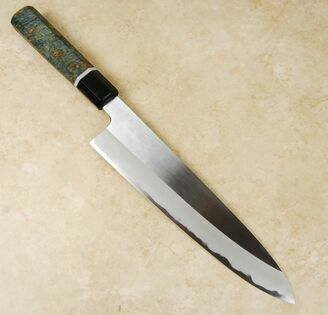 The knife featured here is from his Hontanren (hammer forged) series and is made with Blue #2 high carbon steel which is clad with a softer layer of iron. This cladding is applied in the san-mai style so that the edge and spine are left exposed. 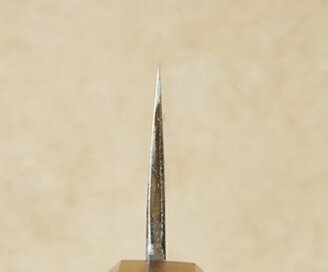 The upper blade road is given a hairline finish while the lower part receives a lovely sandblasted finish. These contrast perfectly with the polished Blue #2 edge. As both the core and cladding layers are reactive, users should expect a patina to develop during normal use. The handle is a beautiful custom octagonal by our woodworker Isaiah Schroeder. 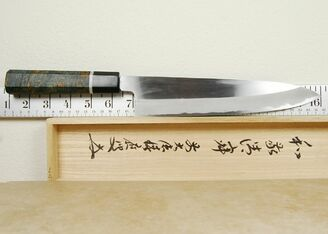 Since each knife is handcrafted, each knife is unique, and any two knives from this line may vary somewhat dimensionally. These are high-end tools in every respect and will make a wonderful addition to any pro chef�s roll or home cook's block. These will be treasured by anyone who loves fine kitchen knives for their aesthetic and functional beauty. Please note the photo handle is current not the video handle.